I need curtains for my bedroom. My new comforter is a warm, dark purple—almost a wine color, but more purple—and my accent colors are lavender, soft gold and dusty green. There are two windows in my bedroom: a small, narrow window, and a wide double window. I haven’t quite figured out how to drape the small window, because it’s situated against a corner, with the molding right up against the wall. 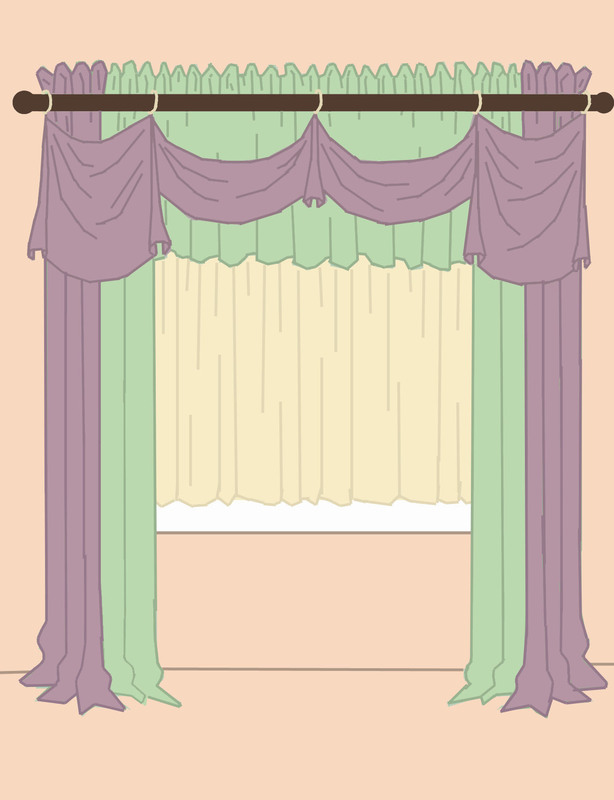 There isn’t room for a curtain rod, not unless I mount it directly to the molding, so I still need to figure that out. For the big window, I fell in love with a set of curtains in The Design Directory of Window Treatments by Jackie Von Tobel*. I tweaked it a little and came up with a sketch I liked. I have the fabric already. The green is a burnout georgette. The lavender is a shot silk dupioni. 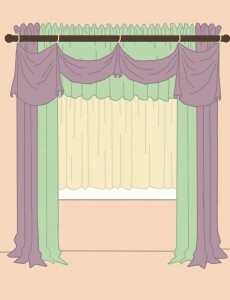 The privacy curtain underneath will be a plain ivory cotton. I might line the curtains with ivory muslin to protect them from the sun. The problem is, I’m concerned that the colors won’t go well with our new comforter. The fabrics were bought based upon our old comforter, which was a much lighter grayish-purple. But our cats accidentally ruined that one, and the dark wine-purple was the best we could find after more than a year of searching. 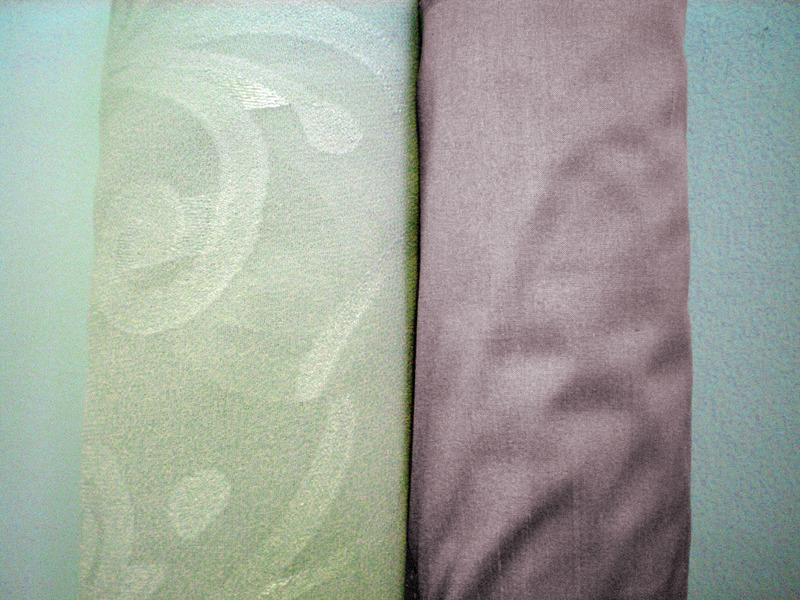 Basically, I need to drape the fabrics at the window to see if they’ll go with the comforter. Then I just need to start measuring, cutting, and sewing. My biggest fear is cutting the fabric and having it not fit the window. Every time I sew curtains, I get the measurements wrong somehow. Even if I double check before cutting, they still end up wrong. The fabrics I bought were not cheap, so I’m afraid of cutting them too short or too narrow and not having enough leftover material to fix the problem. I also need a decorative curtain rod. I keep forgetting that little detail. Have you ever made curtains? Do you have any tips or tricks on how to get the measurements right? * Yesterday’s Thimble is a participant in the Amazon Services LLC Associates Program, an affiliate advertising program designed to provide a means for sites to earn advertising fees by advertising and linking to Amazon.com. 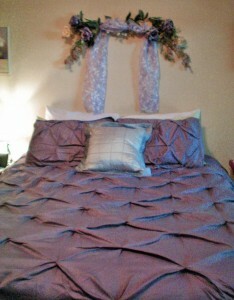 This entry was posted in Sunday's Someday Projects and tagged Fabric, Home Decorating, Sunday. Bookmark the permalink.